John G. Agno is a seasoned corporate executive, entrepreneur, author and recovering management consultant who today coaches senior executives and business owners to reach decision-making clarity by exploring unintended consequences of their future actions in a safe and confidential environment. Coaching is a powerful tool and one that should be used to help guide, direct and nourish people to become better performers. In today's environment of changing technology and evolving organizations, coaching can have a strategic impact. It provides continuous learning and develops people to meet current and future needs. Coaching is an investment that you make in developing your key resource, people, for the long-term benefit of the organization. So what is professional coaching and how does it differ from consulting? Download and listen to this MP3 recording of a recent interview of Coach Agno for the answer to that question. Each of us is defined by many things – our emotional habits, our belief systems, our pattern of thoughts, our cultural upbringing, our preferences, our motivations, our style of relating to others, to name a few. Some characteristics we share in common, some we don’t. What we need to function well will often be quite different from what someone else will need. This is where self-knowledge and personal insight comes in. There is a big advantage in knowing ourselves and the type of environment in which we feel nurtured. But there is also a huge advantage in knowing how a partner, a child, or a co-worker thinks, feels and sorts information. Once we recognize that not everyone is like me and that each of us sees the world through their own lens, we will quickly realize that individuals will approach similar situations differently. It is not necessary that they do it just like me. You cannot afford to miss the richness that comes with understanding your own personality and the benefit it brings to relationships. Let’s face it: you are the most interesting and important subject in the entire world. You will always be at or near the center of your world. It’s a comfortable place to be! 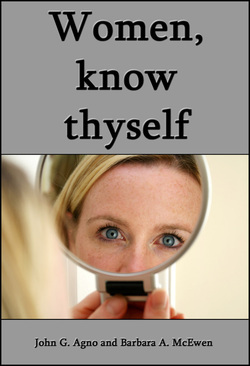 So, one of the most exciting experiences lies in gaining a fuller understanding of just who you are. Effective time management allows you to be more flexible, not less flexible. It facilitates you doing the things you really want to do and to become the person you want to be. When you put these newly adopted coaching tips into practice, everything that comes your way becomes organized. 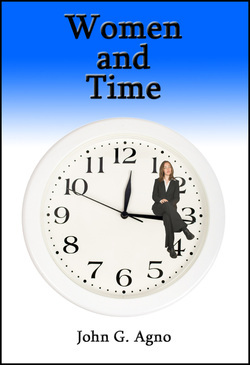 You reclaim your time and life through better work/life integration. This book deserves to be read by all women who strive to achieve fulfillment in both their personal and professional lives. The authors deftly examine the reasons behind why so many articulate and well-educated women today feel overwhelmed and underappreciated. The concept of the book came about because of the very real, very important needs that our female clients repeatably expressed in their struggles with the countless roles and duties that are routinely placed on them. 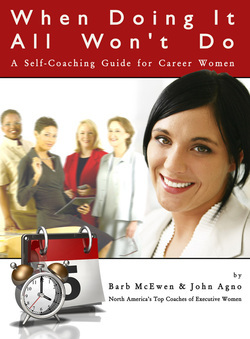 That is why authors Barb McEwen and John Agno, as leading executive coaches of working women in North America, have a unique understanding of female perceptions that affect their work and home life challenges along with what approaches have worked well for our women clients. Let's be clear, this new book isn't just for the dissatisfied. It is a prescription for identifying the various aspects of your life that make you unique, without which, you may never be able to understand why you behave or react the way you do. The book is neither relaxing nor a break from reality where the reader just rides along. It is a vehicle where the reader is in the driver's seat and sets the GPS to get to where she wants to be in her career and personal life. Leadership development is self-development. This book provides leadership skill-building coaching tips along with comprehensive reading sources for people interested in becoming more effective leaders. With so much structural change happening within the world economy, people recognize that we need leaders more than ever before. Developing commitment in a world of "free agents" and "volunteer" talent is not an easy assignment...and… will require effective leadership skills. From 1975 to 1995, according to the Library of Congress, books on leadership appeared at a rate of about 24 a year. In the past 15-20 years, that output has more than doubled. That's a new book on leadership every week, or enough over the decade to wallpaper every classroom at Harvard Business School. 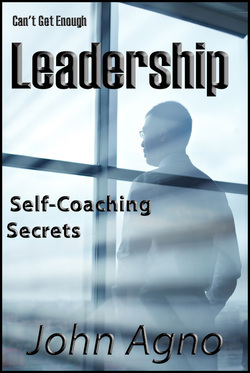 This book is based on leadership book reviews previously published on The Leadership Blog at www.CoachingTip.com where you will find future leadership blog postings that can be read or downloaded to your eReader or smartphone. Baby Boomers were born into the beginning of a long and prosperous world economy. Their children also grew up in prosperity. Now, as the world economy dips into a long period of economic recession, the Boomers approach their retirement years-while many still support their unemployed adult children. These retirement tips can help boomers smoothly navigate toward their second life. Baby Boomers are becoming aware that they are experiencing a different type of retirement than the previous generation. + They need more money than their parents' generation to live comfortably. + Their generation is more self-indulgent than their parents'. + They will be healthier and live longer. Most Baby Boomers (the cohort of Americans born between 1946 and 1964) believe that they will still be working, at least part time, during their retirement years. The oldest, born in 1946, reached 65 in 2011 as they began retirement age over the next several years. 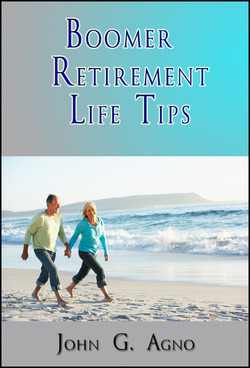 This retirement life tips can help today's boomers design their golden years. Baby Boomers are aware that they are experiencing different types of life issues than the previous generation. 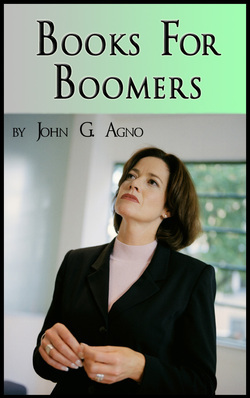 With the oldest boomers now reaching 65 years of age in 2011, this book explores a wide range of these issues: love, marriage, friendship, hopes, happiness, encore careers, health, fitness, parenting and aging along with retirement readiness. Eight in ten say they plan to work at least part-time--and others envision starting their own business or working full-time at a new job or career--according to an AARP Segmentation Analysis: Baby Boomers Envision Their Retirement. By 2015, estimates the National Council on the Aging, 20% of the U.S. work force will be over age 55, up from 13% in 2000. This "phased retirement" of Baby Boomers will shape the American workplace and compensate for a severe talent gap due to a shrinking supply of new workforce entrants. Phased retirement will allow Baby Boomers to engage in work they enjoy while providing needed income. There is one problem that career women face that often goes unaddressed. It is what it means to be wearing the right clothes. A woman’s wardrobe is an essential component of her presentation. It is as important as her handshake, her eye contact and her attitude. The faux pas many women make is that they believe their wardrobe is a reflection of who they are. They are attempting to project their distinctiveness and their individuality. Others prefer to wear what is comfortable thinking that this is appropriate since they’ve noticed others in the office also dress this way. And then there are those who want to be known for their style and creativity. They want to stand out from the crowd. 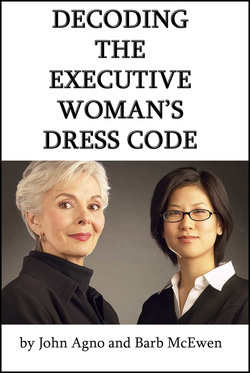 The mistake is that they don’t view the clothes they wear to work as their corporate uniform. Don’t lose the point that the real purpose of “the uniform” isn’t for erasing your identity; its purpose reflects the symbolism that “you’re part of the team.” It creates a visual representation of a common goal and a shared purpose. In the corporate world, the business suit is still viewed as the uniform. This means that, when its leaders are representing the firm, others are not distracted by what they wear but rather the intent is to keep them focused on the message. Different organizations have different uniforms. Your company may not have the same executive uniform as your best friend’s organization. One company’s formal is another company’s casual. To fit in, you need to look at the star players, those people who have power and influence. See what they are wearing and emulate their dress. But you might think, “But it’s only clothing! Clothes don’t mean as much as performance.” Can bare legs, snazzy tops or jeans and sneakers really derail a corporate career?